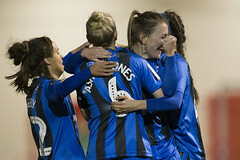 A cold chilly evening in Chatham saw Gillingham take on Queen’s Park Rangers in the women’s National League. Gillingham kicked off underneath the lights and both teams were looking for a win this evening. two minutes in and Gillingham ladies have a early chance to go ahead through some good play down the right, the ball was crossed in by Grace SEELEY for Breon GRANT to get off a shot on target. But a smart save by the QPR keeper with her legs denies Gills an early lead. 10 minutes in and Queens Park Rangers have their best chance of the game thanks to Whitney locke hitting the crossbar from her shot on the edge of the area. 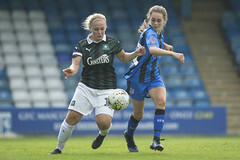 Gillingham keep the visitors under pressure and 19 minutes into the game go ahead thanks to breon grant after the ball was played over the top she left the QPR defence trailing as she calmly slotted it past the Keeper 1-0 Gillingham. Gillingham ladies have another chance 27 minutes into the game with a ball through from kmita to Booker who chips the keeper only to see it bounce back off the post and Bussey, under pressure from the defenders, couldn’t tap it in. 38 minutes into the game and Queen’s Park Rangers have a free kick in a good position and she takes the shot on but it is a easy catch for courtney shanly in goal. A minute later and another ball is played through for Breon GRANT to chase, but this time her shot is well wide of the target and it remains one nil. At half time Gillingham ladies lead one nil after a very good first half, which saw them assured and calm in possession with good interplay.. Shortly into the second half and Queen’s Park Rangers have a chance to draw level but it’s a good save from Courtney Shanly. Just before the hour and Gills are on the attack with a ball played through to booker who sees her shot Saved by the Keeper, the rebound goes to Bussey who can’t quite get her shot on target and misses the chance to extend their lead. 69 minutes of football played and the ball is played through from Huntley to Bussey who’s shot is off target. 5 minutes later and Gillingham ladies have an opportunity to extend their lead from the penalty spot, penalty awarded for a handball in the box. 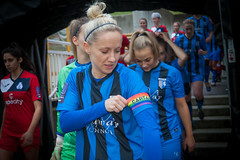 Ellie Manning steps-up to take it and fires past the keeper, goal gillingham who now lead two nil. Full time now and Gillingham get their second win of the season after an impressive display. In a game that was a pleasure to watch they played with high energy, particularly in the first half where they chased down everything. QPR looked much better in the second half but Gills dealt with the pressure and fully deserved the win. The was good vocal support from Gills loyal fans throughout. 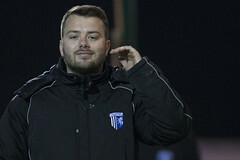 The second win of the season for Gills leaves Queen’s Park Rangers still looking for their first. 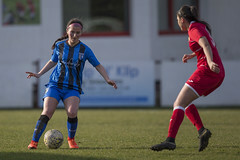 Gillingham Ladies: Courtney Shanly, Ellie Manning, Vicky Ashton-Jones, Daisy Monaghan, Sammy Booker, Mollie Kmita (Harriet Clark 61′), Lydia Huntley, Breon Grant (Emma Sherwood 83′), Poppy Payne (Sharna Giordani 74′), Grace Seely, Alice Bussey. Queen’s Park Rangers Women: Chelsey Dummett, Stephanie Anes, Jeta Bytyqi, Amanda Chimbima, Victoria Grieve, Anya Kinnane, Chontele Lawrence, Lauren Jordinson, Whitney Locke, Jo Wilson, Roschelle Shakes.